That F'ing Monkey: Yank Justice, Great Name or Best Name Ever? I think the answer is pretty obvious; Yank Justice is the best name ever. But who is the lucky person to be graced with this moniker of awesomeness? Yank Justice is the driver of the Bigfoot monster truck; at least he was in the cartoon Bigfoot and the Muscle Machines. 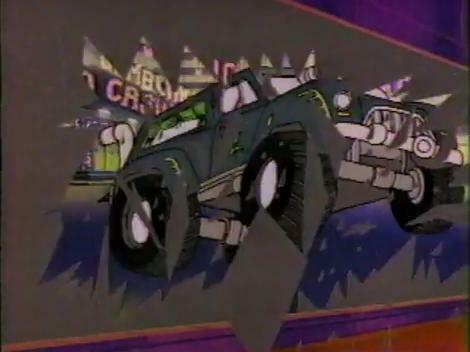 Now unless you were a kid in the 80s or are some kind of monster truck enthusiast, you probably don’t know about Bigfoot and the Muscle Machines. Don’t worry, I’m about to school you on Justice, Yank Justice. This may seriously be the longest article I’ve ever written for the site, but Yank Justice is worth it. In 1985 Marvel and Sunbow came up with an anthology style cartoon. 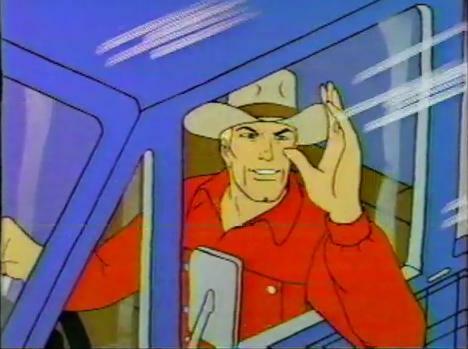 They took four cartoons, cut them up into six minute chunks, and then packaged them all together as a half hour show. Depending on where you were this was either called Super Week, Super Saturday, or Super Sunday. I remember it being Super Sunday. All four series were basically pilot movies with two of them going on to get their own shows. Obviously Bigfoot didn’t go on to getting other episodes, although it should have. The other unsuccessful show was Robotix which was based on a motorized building toy. The two successful ones? Jem and the Inhumanoids. Saying it that way makes the Inhumanoids sounds like Jem's backup band, now that would have been a cartoon worth watching! Bigfoot and the Muscle Machines opens with a woman being chased as she flees a mansion with some kind of rolled up paper and then cuts to a monster truck show in Seattle where we meet our heroes. Obviously Yank Justice drives the “10 tons of brute force” Bigfoot! Then you have the Orange Blossom Special driven by a black Mark Twain look-alike named Professor D. The good professor also has a pet armadillo named Dilly. 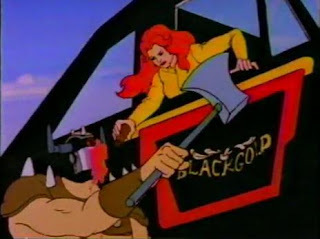 Black Gold is driven by hot identical twin redheads named Red and Redder. Seriously, Red and Redder. Jennifer, the woman fleeing from the bad guys, runs into the monster truck show and hides in a pile cars that are going to be crushed. So of course the bad guys steal a monster truck and get ready to roll over her. Yank being the awesome guy he is, saves the girl from being flattned by monster truck tires. While he is dispatching the bad guys Jennifer hides the paper, which we find out is a map, under Bigfoot’s driver’s seat and then runs off. The villains report back to their boss, Mr. Ravenscroft and we learn that the leader of the henchmen is named Slye. At this point the badguys change out of motorcycle racing gear and into Mad Max style duds with horned helmets. To stop the Muscle Machines the bad guys rig the forest with explosives and set off an avalanche of rocks and trees. Luckily for our heroes, monster trucks can roll over rocks and trees. Easily clearing the obstacle they continue their drive from Seattle to Las Vegas to go to their next show. The Road Warrior knockoffs attack the Muscle Machines with axes, swords, spears, and ball and chains. Red and Redder fight them off by hitting them in the helmets with makeup. The Professor scares a few bad guys off with his armadillo. Meanwhile Yank is pushed through his own windshield and fights on the hood of Bigfoot while it is driving down a mountain road. 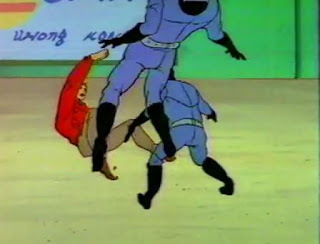 Eventually he punches out the helmeted bad guy and sends him into a river. Slye escapes and the heroes have to make car repairs at a garage at a owned by Ravenscroft. Syle has the garage hit with a wrecking ball. But Yank uses the winch on Bigfoot to catch the ball and eventually send the wrecking ball back into its own crane truck; destroying it. Slye masquerades a mechanic and hitches a ride with the heroes. They've never seen his face so they don't know he is the guy they've been fighting all this time. While in the desert Slye signals for the other bad guys to intercept the heroes. He then shakes up a can of soda and sprays it in Yank’s face to distract him. A small fight ensues as Slye looks for the map under Bigfoot's seat, but he is quickly thrown out of the truck after taking a few punches. Yank chases Slye and is about to be capture him when Slye is picked up by a dune buggy. Yank jumps on also, but he can't hang on as the dune buggy jumps of a hill. 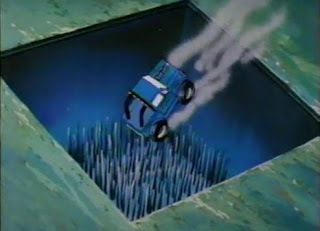 Before he can do anything else the dune buggy drives off a cliff and parachutes safely to the ground below. They get to the next venue and see that a monster truck hearse named Graveroller has been given top billing. Angered, because Bigfoot was supposed to be given that honor, Yank demands a one on one tug of war match against Graveroller. Unknown to him he’s fallen into another Ravenscroft trap. The winner of the match gets the other's truck. Right before the contest Yank finally finds the rolled up map. In the middle of the tug of war is a water pit, which ever truck falls in it would loose. But Red sees someone pouring a chemical into it, which turns it into an acid pit! Because of the acid the chain snaps and Graveroller flees the arena. Bigfoot chases him down the Vegas strip and through a casino. Graveroller turns its flamethrowers on Bigfoot, but Yank drives over Graveroller crushing it. The driver flees butYank quickly catches him. It’s Slye again! Looking for her map, Jennifer steals Bigfoot. Yank leaves Slye and manages to jump into Bigfoot and grab the map before Jennifer can find it. Jennifer and the group form an uneasy alliance where the heroes offer to help her follow the map but she refuses to tell them what is at the end of it. Halfway through the drive to Florida we see Jennifer and Yank bumping heads. 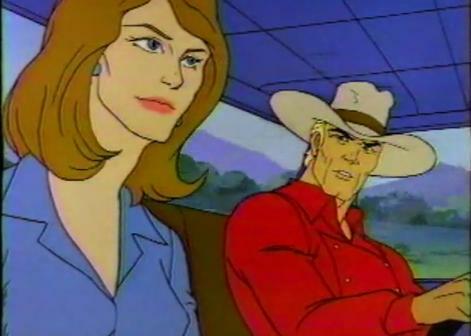 Jennifer has the nerve to question that Justice is Yank’s real name and accuses him of flirting with her. Yank advises her that he likes, “Bigfoot, my team, and freedom. And that about covers it.” The group is then attacked by four large farm thrashers and Redder takes time from potentially dying to complain that Jennifer grabbed onto Yank in fear. Yank saves the day using the winch to drag the machines into each other destroying all of them in less than 10 seconds. 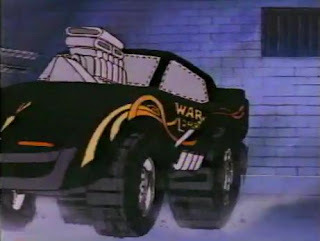 Close McCall shows up in the War Lord funny car and offers to help. The team declines his help and he drives off. 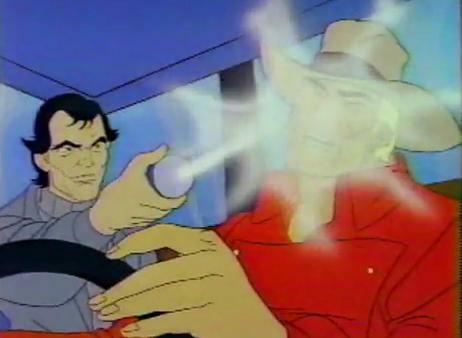 Later the team is pulled over by a sheriff and like 20 other officers who imprison the heroes. The cops find the map while everyone watches on from the jail. Ever the badass, Yank asks, “How come I never have a hand grenade when I need one?” Slye shows up and demands Jennifer translate the map for him. As she is doing so, Close McCall drives past all the cops and breaks down the wall of jail. Red is smitten. Jennifer is still captured though and Yank using Bigfoot’s winch saves her. You can see that winch gets a lot of use. The cops give chase and our heroes have to jump a bridge to escape. Only Bigfoot misses the jump and sinks into the river. Everyone fears the worst but Bigfoot floats to the top and starts driving down the river and finally makes it to safety. We find out Jennifer lied to Slye and didn’t really translate the map. In fact she gave him the wrong information completely. Slye is fired after his repeated failures. Jennifer explains to the heroes that billionaire Adrian Ravenscroft is the one sending all the bad guys after them. 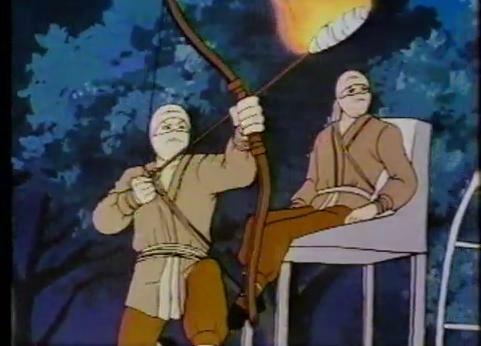 While Close accidently hits on Redder (who hates him) instead of Red their camp is attacked by airboat riding, fire arrow shooting, ninjas. The ninjas chase the heroes into meeting Barbarian, an even bigger monster truck covered in spikes. He faces off with Bigfoot and starts pushes him towards a spiked pit! Bigfoot can't stand up to the larger truck and is pushed in. We see Bigfoot tumbling towards all of those spikes. Talk about a cliffhanger! What will our heroes do? How will they survive? You’re going to have to come back tomorrow to find out. That’s right, for Yank Justice I’ll update the site on a Sunday. So check it out tomorrow and see how the movie ended and a little bit about this awesome cast.